S.A. Larsen, Award-winning author of middle grade & young adult fiction: Wistful YA ~ MY OWN MR. DARCY Tour & Giveaway! Wistful YA ~ MY OWN MR. DARCY Tour & Giveaway! If you know anything about me and my literary attractions then you must know I'm a MAJOR Jane Austen fan. And to an even greater extent, a Pride and Prejudice junkie. Sooooooo...when I was contacted this summer about a new adult novel encompassing the 'Lizzie' Bennett and Mr. Darcy theme, you bet I snatched up the opportunity to read and review for the author. I'd like to thank the author for supplying me with a copy of this book in exchange for an unbiased review. Description: After being dragged to the 2005 movie Pride and Prejudice by her mother, sixteen-year-old Elizabeth’s life changes when Matthew Macfadyen’s Mr. Darcy appears on the screen. Lizzie falls hard and makes a promise to herself that she will settle for nothing less than her own Mr. Darcy. This ill-advised pledge threatens to ruin any chance of finding true love. During the six intervening years, she has refused to give any interested suitors a chance. They weren’t Mr. Darcy enough. Coerced by her roommate, Elizabeth agrees to give the next interested guy ten dates before she dumps him. That guy is Chad, a kind and thoughtful science teacher and swim coach. While she’s dating Chad, her dream comes true in the form of a wealthy bookstore owner named Matt Dawson, who looks and acts like her Mr. Darcy. Of course she has to follow her dream. 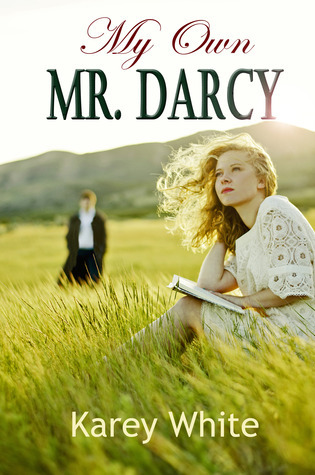 But as Elizabeth simultaneously dates a regular guy and the dazzling Mr. Dawson, she’s forced to re-evaluate what it was she loved about Mr. Darcy in the first place. My Splats: "Pride and Prejudice enthusiasts will love this modern spin on one of the most timeless love stories ever told. Social status, stubborn attitudes, and preconceived notions mix with a surprising love triangle that keep readers' hearts guessing until the very end." I hate to say this by...OMGosh, was this cute! It was more than cute, really. But if you're a girl who's ever had a massive crush on an untouchable guy you know what I mean. In this case, though, the guy wasn't all that untouchable. He eventually became pretty tangible. But what made this different from the original Pride & Prejudice was that this Lizzy was presented with another option--a suitor who was acceptable, unlike Mr. Collins in the original story; really, he was more than acceptable and taken for a good 'guy' friend. The opening hooked me. It could have been because I'm a major Darcy fan or the way the author used the intro of a teen and her mom viewing the actual 2005 Pride & Prejudice movie; either way, I wanted to read on. There was a dreamy tension between the way this story's Lizzy related to the actual Elizabeth Bennett's reactions to the real Mr. Darcy. This Lizzy was an interesting character. She dreamed of being a great interior designer one day. She even held a degree, but currently worked as a bank teller, waiting for her big break into the design world. She was a dreamer, and had lusted for a man as credible and loyal as Mr. Darcy as long as she could remember. Her BFF (since high school) even argued about it with her. And, of course, her Mr. Darcy finally waltzed into the bank where she worked. His name: Matt Dawson. Perfect. Tall, dark, handsome, and as stately as the fictional Mr. Darcy this Lizzy had fallen in love with as a teenager. Through awkward social gatherings with Matt's snobbish circle--and yes, there was a Caroline and incredibly rude aunt--strangely comfortable encounters with the teacher's family, new and unexpected interior design opportunities both personal and professional, the reader traveled along with Lizzy as she sorted out her true feelings and what she really desired out of life. Did she really want Mr. Darcy. Or could her Mr. Darcy be of a different shade, economic background, and personality altogether? Um...you'll have to read to find out. Trust me; you won't be sorry. So, prey tell. Are you and Mr. Darcy fanatic? Did you read any of Jane Austen's works in HS. If so, which did you prefer? What a cute take on a classic story! I wasn't sure if there was anything original to be done on P&P anymore, but it sounds like this book actually examines the appeal of the classic book (and movie) and compares it to real life. Which is a good thing. It really was and, yes, it does. I wasn't sure either, when I agreed to read it. But once I started, I was glad I did. It was a really easy read, too. Thank you for the lovely review! I'm so glad you enjoyed My Own Mr. Darcy. I had so much fun writing it! With all the reading options there are, I'm always honored when someone takes the time to read one of my books. Geez, you sound like me. I've had my eye on this one. After reading this, it definitely stays on my to read list. Can't wait. I love P & P.
LOVE P&P and this book sounds like a fun read! I'm adding it to my TBR list. Thanks, Sheri! Thanks for sharing your review of the book. Nice cover. Sounds like a fabulous book! Thanks for the review! I am seriously intrigued by this review. I'm sorry to burst bubbles out there, but I always thought Darcy was a complete turd. I think many women make the mistake of carrying unrealistic expectations of romance around. I like the idea that this Lizzie is forced to evaluate fantasy vs. reality. No bubble burst here, Nickie. I appreciate your honesty. I totally agree with women falling into the vice of unrealistic expectations where romance is concerned. Even the most romantic guy will eventually fall off the wagon once you've been together a long time - especially after you've been married awhile like I have...21 years.